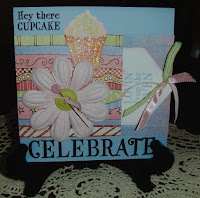 I was playing with my Cupcake Sprinkles set again, and I came up with this cute little 6x6 card. I just love the glitter on the cupcake and frosting. And of course, I can never resist putting a Pretty Pin in the mix somewhere!! Cute card - How did you do the glitter - did you spread the liquid glass and sprinkle it on? I used my Bonding Memories Glue Pen to put Prisma Glitter on the cupcake wrapper. then I gave it a shot of hairspray. :) That seems to acts as a fixative and hold the glitter in place! For the frosting, I stamped in Blush, and then I put Liguid Glass over it. Right afterwards, I sprinkled with Prisma and tapped off the excess. So easy and sparkly!